Hercules is the COC’s fifth excursion into Handel and it is so exquisitely sung and played that one can almost overlook some of the peculiarities of Peter Sellars’ direction. This is not an aesthetic disaster like Zhang Huan’s production of Handel’s Semele of 2012. 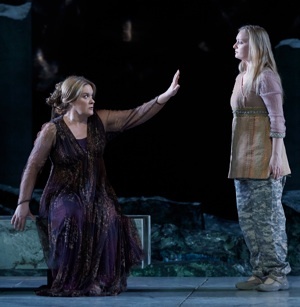 Sellars, whose last production as the COC was video-backed Tristan und Isolde in 2013, has at least come up with a concept one can tolerate even though the way he carries it out is not illuminating. The production premiered in Chicago in 2011 and arrives in Toronto, its Chicago cast intact, to become the first fully staged production of Handel’s 1745 oratorio in Canada. Tafelmusik performed a “semi-staged” version of the oratorio in 2012 directed by Opera Atelier’s Marshall Pynkoski. While the performances of the COC production are definitely worth hearing, those who enjoyed Pynkoski’s non-obtrusive method of storytelling may not wish to deal with Sellars’ sometimes misguided attempts to make the story relevant to Americans. Sellars has removed the action from the realm of Greek mythology to the time of the Second Gulf War with Hercules portrayed as an American general. The original story is about Hercules’ return home after his famous Twelve Labours and a war with the city of Oechalia. The Reverend Thomas Broughton’s libretto is based on Sophocles’ tragedy The Women of Trachis (c. 450bc), which presents an ironic counter-story to the homecoming of another hero after his labours, Agamemnon, in Aeschylus’ eponymous tragedy (458bc). Both heroes are killed by their wives but for very different reasons. One problem with Sellars’ vision is that we don’t really know where Hercules’ home, Trachis, is located. 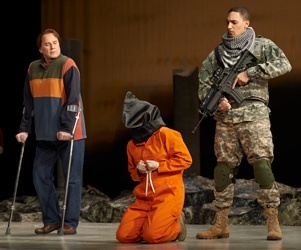 Costume designer Dunya Ramicova dresses him and his men in desert camouflage and his prisoner Iole in an orange jump suit with black hood that Sellars says in his Director’s Note is meant to evoke the detainees at Abu Ghraib. Set designer George Tsypin depicts Trachis with two ranks of ruined Greek columns on either side of a large rectangle of rocks that occasionally glow red as if not yet cooled after a volcanic eruption. The impression, thus, is not that Hercules has actually arrived home, i.e. somewhere in the US, but at a base camp somewhere in the desert in the Middle East. The concept consequently erodes the distinction so central to the story of Hercules’ leaving the perils of struggle and war behind finally to enjoy comfort and peace at home. on and roughly treated as if she were a common detainee? Beyond that it seems incredibly cruel for Sellars to force Crowe to sing two thirds of her first aria with a bag over her head. Hyllus is meant to fall in love with Iole at first sight, but that first sight must be when he finally gets up the courage to take the bag off her head. One design feature new to the Toronto production since its run in Chicago is giving Hyllus (Richard Croft) forearm crutches. Unfortunately, Sellars does not teach Croft how to use them. He has Croft repeatedly embrace Iole by trapping her between the two metal poles, when the whole point of forearm crutches is to allow the arms to be free. Were he using them properly, Croft could have simply let the crutches swing back at his elbows to embrace Iole with his arms. The crutches are a bad idea anyway since it makes Hyllus statement to Dejanira, “Tomorrow's sun Shall see your Hyllus bend his pious steps To seek the hero through the travell'd globe” seem unrealistic rather than heroic. They also turn Hercules’ dying instructions to Hyllus to carry him to the top of Mount Oeta into an impossible task. Sellars’ note claims he is interested in the effects of war on those at home, so when Dejanira hears of the negative omen from Lichas in Act 1, she pops pills that Sellars tells us are “tranquilizers” from three different prescription bottles. This has the effect of making her jealousy appear to spring as much from drug abuse as from any perception of Hercules’ infidelity, even though Sellars has decided that Iole is pregnant, presumably by her captor. Tsypin’s set has the perverse effect of making the majority of the stage unusable so that all the action must be forced into a narrow playing area between the Greek ruin and the edge of the stage. This is particularly noticeable in cramped groupings of the choral scenes. The choral scenes themselves are the victim of Sellars’ worst idea. He decides to have the chorus to act out their words with hand and arm gestures, rather as if it where a pop group from the 1960s. Therefore, in “Jealousy! Infernal pest,” the chorus acts out brushing away a bug, crushing it in one hand, and looking to see if it is dead before casting it away. This action occurs with every repetition of the word “pest” so that what is meant to be serious becomes unintentionally comic. It does not help that the chorus members’ performance of these pointless gestures ranges from enthusiastic to half-hearted. After burdening the chorus with these gestures for most of the opera, why Sellars omits them for the final chorus is a mystery and makes their earlier use appear a nonsensical whim. The chorus’s gestures are in fact only one manifestation of Sellars’ general practice throughout the opera of having the singers repeat exactly the same actions with every recurrence of the same words. Thus during Hyllus’ aria “Let not fame the tiding spread”, Hyllus attacks Iole, hands her to a soldier, and she frees herself at least three times in a row. Handel’s use of repetition in music is part of its architecture. Repetition of the same action on stage leads only to tedium. All of this directorial nonsense may sound disheartening, but it is not as infuriating as what we have seen recently in Christopher Alden’s Die Fledermaus in 2012, the same director’s La Clemenza di Tito in 2013 or the Jossi Wieler and Sergio Morabito Un ballo in maschera earlier this year. The singing and playing really are so spectacular that they triumph over Sellars’ staging. the cast. She won increasing praise with every aria, but the sheer beauty and immense sympathy she brought to “My breast with tender pity dwells” brought down thunderous applause. Alice Coote’s Dejanira was hampered by Sellars’ depiction of her as in a drug-addled fog throughout. Nevertheless, Coote showed complete control over her rich, powerful voice and caressed the words of her arias with unmatchable intelligence and delicacy. Her account of Dejanira’s mad aria, “Where shall I fly?” was absolutely thrilling. Richard Croft was a rather mature Hyllus, but the sweetness of his tone and the nimbleness of his runs made his every appearance a pleasure. David Daniels was in fine form as Hercules’ servant Lichas, his countertenor having only grown in richness and lustre through the years. Sellars had decided that Hercules was suffering from post-traumatic stress disorder, which Eric Owens duly enacted though this meant we had even less access to the character’s personality than usual. Owens displayed his sepulchral bass to fine effect, but it was a great pity Sellars should have him sing his dying aria, “O Jove, what land is this” while lying on his back mid-stage projecting into the fly tower with a resultant loss of clarity. Conductor Harry Bicket worked the magic has he has done previous occasions in making the COC Orchestra sound as light and lithe as a period band. The detail was so clear in the continuo that one could distinguish the wonderfully expressive contributions of the archilute. Here in the pit, not in Sellars’ staging, was the opera’s prime source of precision, vitality and drama. Photos: (from top) Alice Coote as Dejanira and Eric Owens as Hercules;. Richard Croft as Hyllus, Lucy Crowe (in hood) as Iole and Kaleb Alexander as Soldier; Alice Coote and Lucy Crowe. ©2014 Michael Cooper.